Biomedicalization is seen as the natural outgrowth of continued scientific progress--a movement towards improving the quality and quantity of life through scientific inquiries using biomedical perspectives and methods. This approach carries with it the assumption that with "proper" risk assessment, detection, and treatment, our lives can be lengthened, improved, and indeed more fulfilling. Yet critics question biomedicalization's ability to deliver. There is concern about how biomedicalization can change our traditional concepts of health as we discover more conditions for which we are at risk, and health maintenance is seen as the responsibility of the individual. 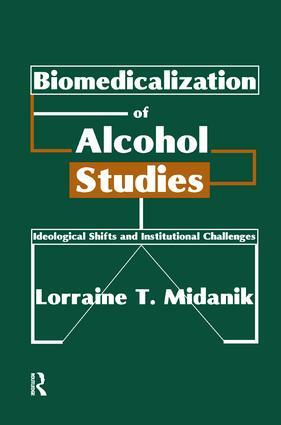 The purpose of the book is to describe, assess, and critique biomedicalization and its influence as a larger social trend on the health field and specifically in the area of alcohol research, policy, and programs. Chapter 1 gives a broad overview of biomedicalization. Chapter 2 lays the groundwork for a historical understanding of how medicalization and biomeidcalization have developed and are expressed in diverse fields such as aging, psychiatry/mental health, and women's health. Chapter 3 focuses in-depth on alcoholism and assesses the development and assumptions underlying the two movements that have greatly influenced the substance abuse field: the medicalization of deviance and the growth of the disease model of alcoholism. Chapter 4 discusses the origins and development of the National Institute on Alcohol Abuse and Alcoholism (NIAAA) from its inception in 1970. Chapter 5 illustrates the growing biomedicalization that has occurred in the alcohol field prior to NIAAA's movement to the National Institute of Health (NIH). Chapter 6 assesses how Sweden has handled alcohol problems and currently funds alcohol research. Chapter 7 concludes with a rationale for an expanded discourse between social scientists and biomedical researchers working on social problems, particularly alcohol issues. This volume will stimulate discussion of the processes by which social problems, and specifically alcohol issues, are framed, managed, and studied. It will hold particular interest for researchers and students in the areas of alcohol studies, social science, and social welfare. Lorraine Midanik is a professor in the School of Social Welfare, University of California, Berkeley.